ESD Hand Gloves :Designed for use in particle sensitive and low-contaminate environments, anti-static or electrostatic discharge (ESD) gloves help protect both the worker and the environme nt. These types of gloves feature a blend of soft conductive and synthetic fibers. You can prevent damaging static discharge with ESD gloves that we’ve designed to help enhance your skills and safety.When working in electronics assembly, gloves are worn with the intention of keeping oils from the skin off the circuit boards; however, other anti-static procedures must still be employed. Using ESD gloves allows this to be done much more efficiently. In any ESD protected work place, such as electronics manufacturing and repairing, hand protection against static electricity is important. Electro-Static Dissipative (ESD) hand gloves are used to protect against static discharge and contamination that may cause damage to materials being handled. However, just use of ESD hand gloves is not enough. 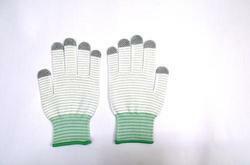 We are well known for offering best quality ESD PVC Dotted Gloves. These gloves are fabricated from best quality nylon, which is known for optimal strength and good elasticity. These are manufactured with different materials including Latex, Nitrile, Polyester, and Vinyl that provides complete protection in static charge environment, particle sensitive & low contaminate environment. This array includes Anti Static Gloves, ESD Gloves in all sizes and all materials. We offer perfect blend of cost and quality. To import raw materials used in manufacturing, we rely only on reputed vendors of the industry. Our products are manufactured with utmost precision and matches to international standards. 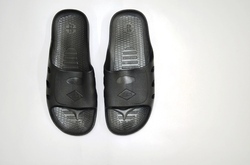 That’s why we are today reckoned among most trusted suppliers of ESD Footwear, Shoe Cover, ESD Shoes, Anti Static Shoes and all other Electro Static Discharge products. 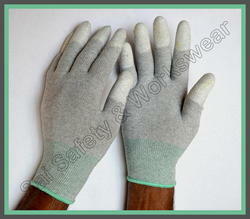 Quality being the prime concern, we are into trading quality approved range of ESD Dotted Glove. We are well acknowledged about the allergic reactions that are caused by rubber, thereby we procure the entire product range from certified vendor base that utilize quality approved components and advanced technologies. They are soft and skin friendly in nature. 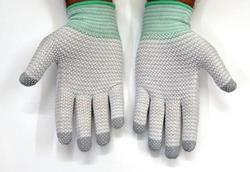 With long years of experience and sincerity, we are offering best and most perfect quality array of ESD Gloves. These offered collections of gloves are acquired from best vendors of the market. These gloves are PU finished and available in ESD dotted finished. 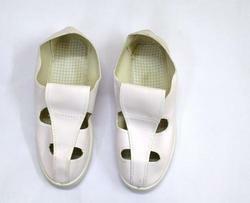 They are water proof and available in many specifications. They are tested along side with many quality norms to keep it as pr required level. They are affordable in rates. 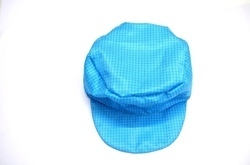 ESD Sports Type Caps are used to keep the hairs away from the clean room & an excellent anti-static effect, dust-proof performance.